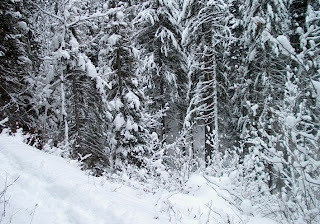 Well, I had ambitions of leaving Seattle early Saturday morning, December 1, driving to our cabin in Cle Elum, suit up for a winter hike, drive up to the Teanaway valley, climb to the top of the Jungle Creek trail and get back to civilization before it got dark. It didn't quite work out that way, but was an enjoyable day nonetheless. After a sleepless Friday night due mainly to the unfathomable exploits of our 16-year old daughter, I left Seattle at about 830 and was in Cle Elum a little after 10, where I found about ten inches of snow and a freezing cold house. After warming up the house a little and having a quick breakfast, I jumped in the car and half an hour later I was on the Jungle Creek road near the north fork of the Teanaway River. The road had not been plowed and with about a foot of very light snow I was able to get within a mile of the trailhead. 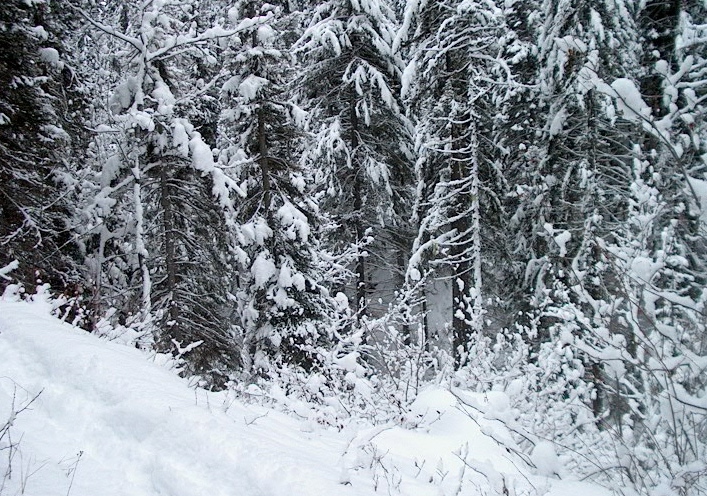 Not another soul was in sight--it's slightly too early for snowmobiles and too late for most hikers. Perfect conditions for an early winter hike. I slogged up the road, taking nearly a half hour to get to the poorly marked trailhead. Was hoping that once I got into the trees, the snow wouldn't be so deep, but that didn't prove to be the case. Very hard going for the first half mile or so with the snow deep and the trail crossing the creek several times. The temperature was probably near 20, but I was down to just a sweater as the sun was trying to come out and there wasn't a breath of wind. After a mile and a half the trail became steeper and the snow deeper. It was farther into the woods I had been on a winter hike in a long, long time and being alone added to an eerie feeling of being totally cut off from the real world. With the flat light and snow starting to fall, it was a totally black and white world, with the only color being the pale, pale green moss hanging from the fir trees. But the wind soon started and tons of snow was being blown off those same trails, most of it finding it's way down the back of my neck. The steepness of the trail was discouraging and I knew there would be no payoff in terms of a view if I continued to the top, so I did the sensible thing and headed back down. Good thing I did, as I became extremely tired upon reaching the road and was hard-pressed to make it back to the car before dark.